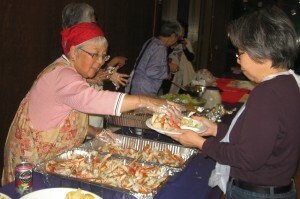 EL CERRITO — J-Sei’s 22nd annual Crab Feed and Drawing will be held on Sunday, Feb. 24, at the El Cerrito Community Center, 7007 Moeser Lane, El Cerrito. Early seating is from 4 to 5:30 p.m., late seating from 5:30 to 7 p.m., take-out from 4 to 6 p.m.
On the menu are fresh Dungeness crab, Asian salad, garlic noodles, rolls, desserts and beverages. J-Sei will take a moment to recognize Kaz Iwahashi, Ben Takeshita and Esther Takeuchi for their many contributions to J-Sei and the community. Drawing tickets are $2 each or $10 for six. There will be a chance to win $500 cash or two nights at the Monterey Plaza Hotel and Spa. Dinner tickets are $40 in advance, $45 at the door. For children under 12, admission is $15. Sponsored by Homestead Senior Care.